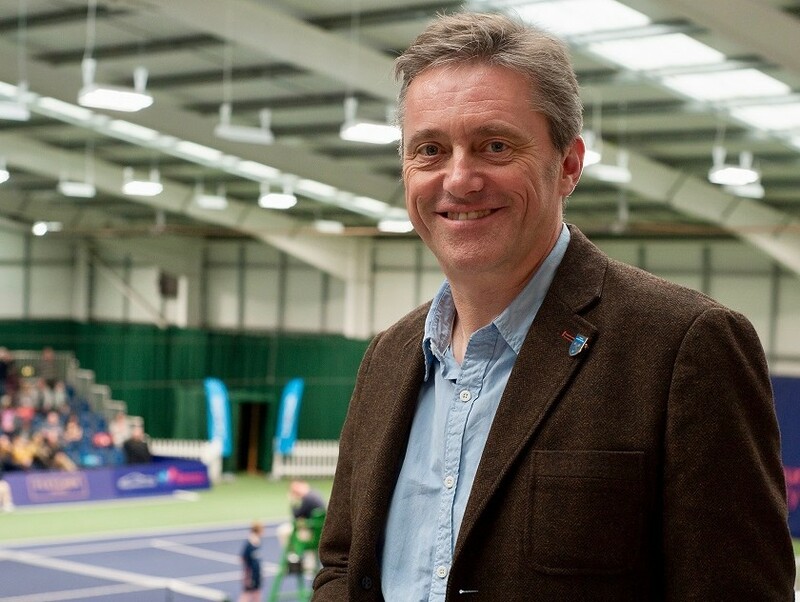 Dave Courteen is the managing director of The Shrewsbury Club, an award-winning health and fitness club which also hosts international tennis tournaments twice a year. It's part of his role as managing director of Mosaic Spa & Health Clubs, which run 35 health clubs across the UK, including 21 with spas, and employs nearly 600 staff. We operate health clubs and day spas across the country. Myself and Steve Taylor, a friend from university, started the business 32 years ago. A large part of what we do is mainly within hotels; that’s the core market we are involved in. Having run other people’s health clubs for more than 20 years, we wanted to run our own so, backed by a venture capital company, we bought The Shrewsbury Club out of administration in 2011. We also bought another business the following year, just over the border in Herefordshire, Holmer Park, which is a day spa and health club, so those are the two businesses we own the freehold for. Since then, in partnership with a Shropshire-based entrepreneur, we have bought out the venture capital company and now own both clubs outright, with the Mosaic business managing them on a day-to-day basis. It’s 32 years now after setting the business up straight out of university with Steve. We have been through a number of different guises and were once part of a PLC. We have had some other shareholders that have joined and left, but Steve and I have been the one constant. There probably isn’t a typical week. I look after The Shrewsbury Club, which I consider a real blessing as part of my job, so I spend one or two days a week in Shrewsbury and I really enjoy spending as much time as I can here. I spend one day every other week in the Mosaic head office in Norwich. The rest of the time I’m on the road visiting our sites, so I could be anywhere in the country, from Newcastle to Devon, or elsewhere like London. I quite like going from one place to another. I’m also lucky enough to be involved in a number of industry organisations like UK Active, which is a pressure body to promote more people getting more active more often and helps to grow the industry. The biggest challenge is undoubtedly finding people to work within the health club industry. It’s also becoming tougher to keep people. It’s naturally an industry that is full of young people, which is great. It’s very important to show people they can can have a career path in health and fitness and not just view it as a first job or stepping stone to something else. It’s not a particularly well paid industry, so that’s part of our challenge too. As a nation we are realising that we need to take more responsibility for our health and we need to be more active. Health clubs are only one solution. They aren't going to work for everybody, but they are a great way to get fit in terms of providing the commitment and support required for people to maintain a regular exercise programme in a fun and community-based environment. There’s still only around 15 per cent of the population that are active and members of a health club, so 85 per cent of people still don’t exercise regularly. I think over time that will have to change, so that’s the opportunity. It’s definitely around providing them with a career path. We are passionate that one of our core values in Mosaic is that we promote people from within. Nearly 90 per cent of our managers have been promoted from within our organisation. It’s just showing people that they are valued and listened to. We work really hard at Mosaic to try and create opportunities for staff to feel they have a voice to be heard as that’s really important. So many people will tell you getting the best out of your staff is linked to incentives, commission and through financial rewards. I’m not going to say that doesn’t play a part because obviously it does, but I believe you get the best out of your staff by valuing them and making them feel they are listened to and cared for. It was planning the tournament programme for the next World Tennis Tour event, a men’s $25,000 tournament, which we will be holding at The Shrewsbury Club in September. They are always exciting weeks and we hold two events featuring professional players from around the world each year. The meeting lasted for about half an hour and was very productive as we came up with ideas for all the articles which will be included in the next programme. I receive between 200 and 250 emails a day. A lot of those are copying me in or they are people trying to sell me things, so I’m afraid most of those just get deleted straightaway. It is one of the biggest challenges in how my role has evolved as when I started the business emails didn’t even exist! I probably spend an hour, an hour and a half, just sorting emails out every day. When I start on a Monday morning, if I have had the weekend off, I probably have about 500 emails to go through as we are a seven-day week business. The right work-life balance is a real challenge. I think particularly when you own your own business it is difficult to switch off. This is a 365-days-a-year role as half of our clubs are open on Christmas Day and Boxing Day because they are in hotels. There’s never a day when one of our clubs isn’t operating. When I go on holiday, I put on my out of office notification and my mobile phone is switched off. I just don’t go near them and I completely switch off and unwind. Over the weekend, I will make sure that the priority is running my children around and spending time with my family. But I do answer work calls and check emails at home. Sometimes it’s less stressful to check and deal with an issue at the weekend which might take me 20 minutes to sort out as opposed to festering over the weekend and taking a lot longer to resolve the following week. I would hope they would feel I am someone who values them and cares about them as individuals, not just about what they do. That for me is the most important thing. The Brexit process has been a universal disaster. It’s a classic example of how poor leadership, in my opinion, can create a mess. It’s also an example of where people have put their own interest and career goals ahead of the common good. I think it’s incredibly sad the position that we are in and, like many people, I have no idea what the outcome is going to be. As a business, we have already received letters at The Shrewsbury Club from our tennis ball suppliers explaining that we may not be able to get tennis balls over the course of the summer as, depending on Brexit, they will have to restructure their business to continue to supply us. Our spa products house, which we spend £250,000 a year on, has withdrawn from the UK market because of uncertainties over Brexit. Every business has been touched by Brexit whether they want to admit it or not. I’m just frustrated beyond measure that this is getting in the way of everything else that the government should be doing. One of the lowlights was when we became part of a PLC which ran into trouble. It meant all the money that we would realise from the sale of our business after 14 years was lost because of what happened with the value of the PLC. Business is always a rollercoaster. One of the highlights would be turning The Shrewsbury Club around and seeing how it’s become a success and financially viable. I also take great pleasure in how some of the managers we have developed have flourished. Six members of our team have been with us over 20 years and it’s been fantastic to see their careers develop. Many others have also grown their careers with us, or elsewhere within the industry, and I’m immensely proud of that. People that get involved in gossip and create issues within their team. A lot of our HR problems arise because of it and that frustrates me. We have always talked about in our business that a smile is the shortest distance between two people. That’s so true. It’s also so important to maintain integrity and to treat everybody with respect. Over time I have learnt that some people will abuse that trust and respect, but it’s still the right way to behave anyway. I love to play tennis if that counts as being away from work given that I’m running a health club with tennis courts at The Shrewsbury Club. I love to go for a run and I set myself a goal of running a certain number of miles each year. I love spending time with my wife, two children and our dog. I also watch Ipswich Town Football Club with my daughter - but I’m not sure if that could count as relaxing! I only live in Shropshire for part of the week, but I think the degree of support and openness, the way that everyone works together for the common good in Shropshire is something that I’ve not experienced to the same degree in business communities in other parts of the country. That’s part of the reason why I love Shropshire. There are lots of people that just want to help other businesses, work together and help them succeed. It’s certainly helped The Shrewsbury Club thrive and it makes the Shropshire business community special. When I was younger, at the start of my career, I worked at a holiday centre in Suffolk which developed a theme park. I spent some of my time being Woody Bear, the theme park's mascot. I was also on the entertainment team which meant I had to sing and dance. Great memories for me, but probably not for those who had to sit through my performances! I love the books Rob Bell writes so I would take one of them. The film would be Cry Freedom, with the CD The Way It Is by Bruce Hornsby and the Range. I’m an Ipswich supporter through and through so Bobby Robson, a legendary manager for the club, would definitely be on the guest list. I love my tennis so I would invite Andy Murray - what a story he has to tell. The guest list would also include Nelson Mandela, such an inspirational person, and Baroness Tanni Gray Thompson, who is extremely entertaining and has achieved so much. I would also invite my wife Miranda, an amazing cook, and I wouldn’t want to be at a dream dinner party without her! I would ask my wife if she would cook one of her specialities, ribs of beef with dauphinoise potatoes, followed by tiramisu.